I took a little time out of my day to hit the theatres for the latest possession horror story to come out of Hollywood. 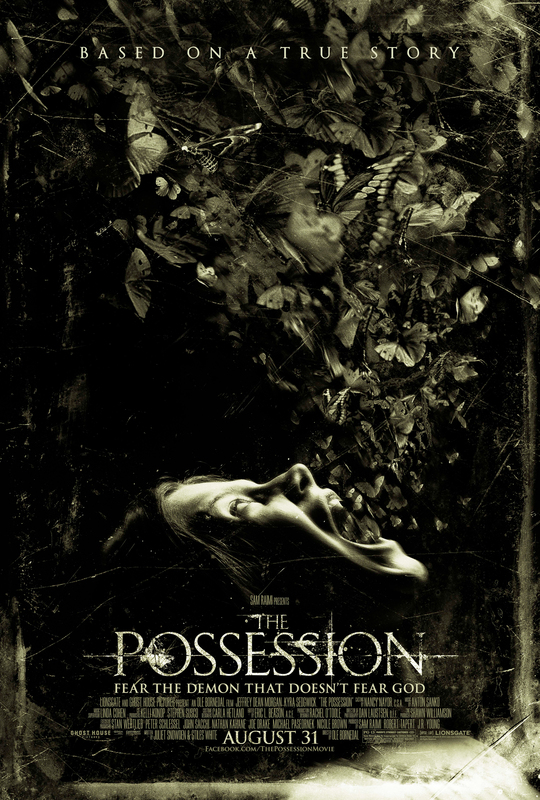 Appropriately named The Possession These movies come out fairly often and I am the first to admit I have a weakness for the format. I always enjoyed possessions, demons and ghosts in my horror and for some reason they seem to be the big trend in a lot of mainstream horror – which is good for me I guess. The film was directed by Ole Bornedal and was produced by Sam Rami; it stars much to my enjoyment Jeffrey Dean Morgan who you all will most likely remember as the Comedian from Watchman. Special mention goes out to Natasha Calis as Em who plays the victim of this tale. Well I guess there are more victims…whatever. The story revolves around a family in the first year of a divorce. A father (Morgan) gets his kids every weekend from their overprotective mother. The mother is dating some douche dentist. Things come to a head when the father takes his two young daughters to a yard sale to buy some supplies for his new home. The youngest daughter Em (Calis) becomes intrigued by an old box with strange carvings on it. In what I assume is an attempt to buy his daughter’s love the father just buys it for her and that sets off a series of events. You see this box is no ordinary box it’s what’s called a Dybbuk box which is from ancient Jewish faith. Its purpose is to seal malevolent spirits or demons. I should mention at this point that the story is based on “true” events. It’s a classic horror trick I love talking about and for those interested I’ll take a little aside and explain that technically this movie is based on true events. There was a famous Dybbuk box that made its circulation around ebay a few years back and in its travels people reported all kinds of horrific nightmares, hair falling out, visions of an old hag and even being covered in welts. It was eventually bought buy a collector who had the box “re-sealed” and now won’t divulge the location of it. From what I understand this Hollywood story is an amalgam of several different accounts put in to one narrative. I found the concept pretty interesting and was eager to see how the film would play out but even from the trailer I was getting a sense that it wouldn’t exactly be cutting edge storytelling. The acting in this movie is pretty decent, you have every roll competently played and I was suitably impressed with young Natasha Calis who handled a demanding roll quite well. 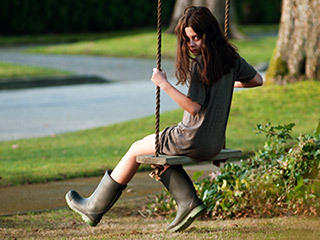 Child actors can be very hit or miss and a lot of the scares come from her ( and special effects). Jeffrey Dean Morgan was fantastic as a father trying to do right by his kids through any means necessary. Even Grant Show as the well meaning but annoying “new boyfriend” plays his character well. He comes off as a bit of a wiener but believable. He also gets one of the best scenes in the movie that would be a nightmare to any dentist. The only person I had a problem with was Kyra Sedgwick’s character of the mother. She flailed a lot and was just unpleasant to me. Moments that required her to emote were way over the top and came off as more funny than dramatic. Everyone else does fine. But it’s just that; fine. My problems with this film start at the plot. It’s about as paint-by-numbers as you can get. I’m not going to knock an entire sub-genre of horror for sticking to formulas but this movie felt entirely too safe for me: A family moving or otherwise changing from the norm? Check Is there a slow possession where one person believes but nobody else does? Check. Bugs? Check. Random, occult professor? Check. Exorcism scene? Check. The end…or is it? Double check. It comes of as predictable which is a shame because it really is well put together otherwise. The special effects and the lore behind the box are great and as I mentioned before it’s acted well for the most part. Now, even though the framework of the story isn’t getting any points for originality from me it isn’t accurate to say this isn’t a good movie it’s just an okay-so-so-not bad-not-great- film that will probably end up being forgotten amongst the dozen or so movies exactly like it in recent years. I will say its leaps and bounds better than the similar but different Apparition that’s also out in theaters and with Paranormal Activity 4 and Sinister also on the way it’ll be even harder for this movie to stand out amongst the crowd. If you’re a fan of this genre of horror and are looking to get your ghost on; I would say check it out but for everyone one else you might wanna just Netflix this when it comes out. This entry was posted on September 1, 2012 at 2:45 am and is filed under Horror Showcase, Updates with tags review, The Possession. You can follow any responses to this entry through the RSS 2.0 feed. You can leave a response, or trackback from your own site.